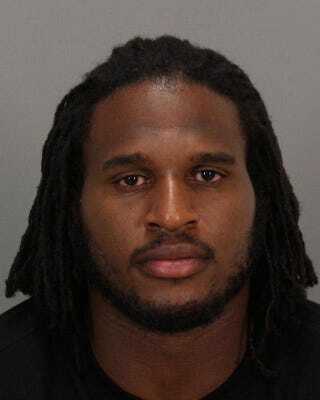 San Francisco 49ers defensive end Ray McDonald was reportedly arrested at his home this morning on allegations of domestic violence. NBC Bay Area's Damian Trujillo broke the story first. According to him, the victim was pregnant. McDonald apparently got into an altercation with his fiance, who a police source said is pregnant. When she showed police bruising, McDonald was arrested. Other 49ers were present, including tight end Vernon Davis and defensive end Demarcus Dobbs. McDonald was booked at 5:30 a.m. in San Jose for "inflicting injury on a spouse or cohabitant." No bail has been set for McDonald yet. Update: McDonald is now out on bail.